(b) Cone cells –The cones contain the iodopsin pigment (visual violet) and are highly sensitive to high intensity light. They are responsible for daylight and colour visions. The innermost ganglionic cells give rise to optic nerve fibre that forms optic nerve in each eye and is connected with the brain. It is the main coordinating centre of the body. It is not the main coordinating centre of the body. It includes brain and spinal cord. It includes cranial and spinal nerves that connect central nervous system to different parts of the body. It is the potential difference across the nerve fibre when there is no conduction of nerve impulse. It is the potential difference across nerve fibre when there is conduction of nerve impulse. The membrane is more permeable to K+ ions than to Na+ ions. The membrane is more permeable to Na+ ions than to K+ ions. Choroid is the middle vascular layer of eye. Retina is the innermost nervous coat of eye. It contains numerous blood vessels that provide nutrients and oxygen to retina and other tissues. It contains photoreceptor cells, rods and cones that are associated with twilight and colour vision respectively. (ii) Cone cells –The cones contain iodopsin pigment (visual violet) and are highly sensitive to high intensity light. They are responsible for daylight and colour visions. The innermost ganglionic cells give rise to optic nerve fibre that forms optic nerve in each eye and is connected with the brain. In this region, the photoreceptor cells are absent. Hence, it is known as the blind spot. At the posterior part, lateral to blind spot, there is a pigmented spot called macula lutea. This spot has a shallow depression at its middle known as fovea. Fovea has only cone cells. They are devoid of rod cells. Hence, it is the place of most distinct vision. 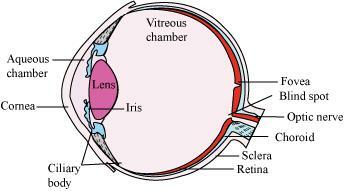 (b) Retina is the innermost layer of the eye. It contains three layers of cells – inner ganglion cells, middle bipolar cells, and outermost photoreceptor cells. Photoreceptor cells are composed of a protein called opsin and an aldehyde of vitamin A called retinal. When light rays are focused on the retina through the cornea, retinal gets dissociated from opsin. As a result, the structure of opsin gets changed. This in turn causes the permeability of the membrane to change, thereby generating a potential difference in the cells. Consequently, an action potential is generated in the ganglion cells and is transmitted to the visual cortex of the brain via the optic nerves. 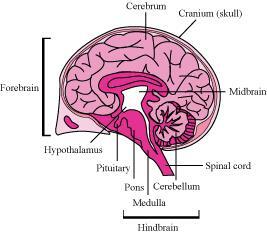 In the cortex region of the brain, the impulses are analysed and the image is formed on the retina. Myelinated axon has a myelin sheath. Node of Ranvier is present between adjacent myelin sheaths. Dendrite is a small projection arising from the neuron. It conducts the nerve impulse toward the cell body. 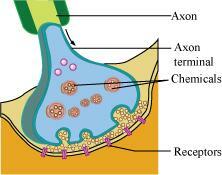 Axon is a single, long projection that conducts the nerve impulse away from cell body to the next neuron. Nissl’s granules are present in dendrites. Nissl’s granules are absent from axons. Axons can be myelinated or non-myelinated. Rods help in twilight vision. Cones help in colour vision. They have visual purple pigment called rhodopsin. They have visual violet pigment called iodopsin. Rods are the photoreceptor cells of the retina that are sensitive to dim light. Cones are the photoreceptor cells of the retina that are sensitive to bright light. In a myelinated nerve fibre, the action potential is conducted from one node to another. 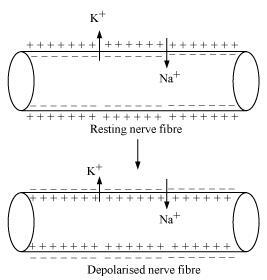 In an unmyelinated nerve fibre, the action potential is not conducted from node to node. It is carried along the whole length of the nerve fibre. The conduction of impulses is faster. The conduction of impulses is slower. Blind spot is a spot on the retina present at the point of origin of the optic nerve. Yellow spot is a small area on the retina present at the posterior pole of the eye, lateral to the blind spot. Photoreceptor cells are absent from this region. Only cones are present in this region. They are insensitive to light as both rods and cones are absent. They are sensitive to bright light as cones are present. Cranial nerves arise from the brain. Spinal nerves arise from the spinal cord. There are 12 pairs of cranial nerves. There are 31 pairs of spinal nerves.